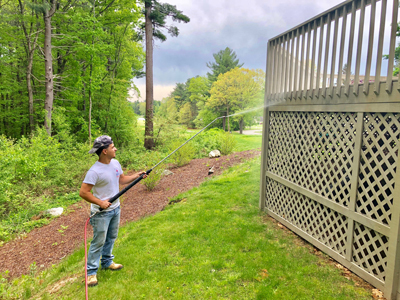 Goddard’s owns and operates a custom made pressure washing system that is one of its kind. We can guarantee you your home will not only be clean but also completely spotless. In 1987 the government wanted manufactures to develop paint that was more environmentally safe. In doing so they removed zinc and mercury which kept bacteria and microscopic organisms out of paint. 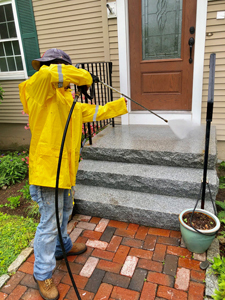 While discovering in the late 80’s and early 90’s that exterior paint was becoming infested with mildew spores, we turned to a Sherwin Williams chemist to find out how to combat the mildew spore. The microscopic organism which needs water and carbon to live was literally eating the paint film. The answer is to burn them by using sodium hypochlorite. Bleach is a byproduct of the chemical. The real task was figuring out how to apply it to homes in large quantities. 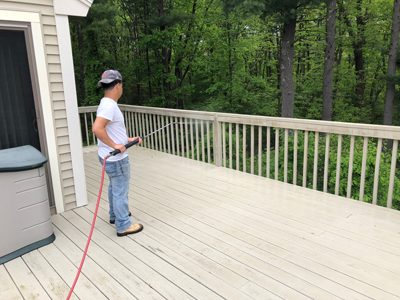 After discussing the problem with some veterans in the pressure washing business we built a system to compress bleach and safely apply it to your home.